Welcome to Underground Energy, LLC. Underground Energy, LLC offers geothermal design, consultation and project management services. Our clients are at the forefront of energy efficiency and sustainability. We go beyond conventional geothermal methods by focusing our services on seasonal storage and recovery of thermal energy in the subsurface - the most energy efficient geothermal technology available today for space heating and cooling. Our mission is simple and bold: we intend to commercialize Geothermal Energy Storage technology in the US and help our clients achieve their goals of reducing heating and cooling energy costs and CO2 emissions, thereby moving the US toward energy independence. Think how much money you could save if you could store some of this winter's cold for free air conditioning next summer. Imagine how secure and comfortable you would be if you could reverse the process and use last summer's heat during the coldest days of winter. Consider the savings you could realize on electricity, fossil fuels and CO2 emissions if you could store and recover thermal energy from one season to the next. Envision how you could improve your brand by embracing the greenest and most energy efficient geothermal technology available for heating and cooling, and what a positive impression that would have on your employees and clients, your tenants and your community. Seasonal thermal energy storage technology is available now. Geothermal Energy Storage technology is well developed and in common use in Europe, but virtually unheard of in the US. It's time to change the way we think about heating and cooling buildings here in America. Innovate! 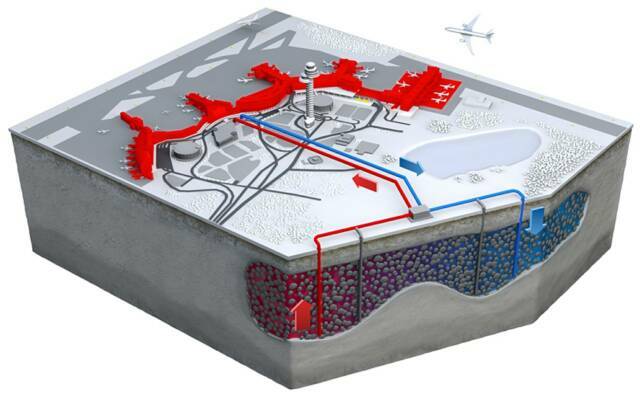 Advanced, proven geothermal energy storage technology for heating and cooling. Save money! Lowest life-cycle costs. Payback in ~ 6 years. Be Green! Reduce greenhouse gas emissions and dependence on fossil fuels. Enhance branding! Build positive publicity. Engage your employees, clients and tenants.